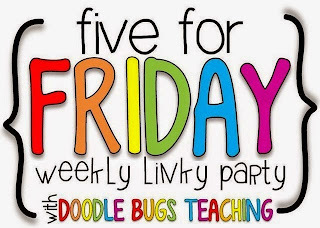 I'm back today to link up with Kacey at Doodle Bugs Teaching for Five for Friday and share 5 things from my week. 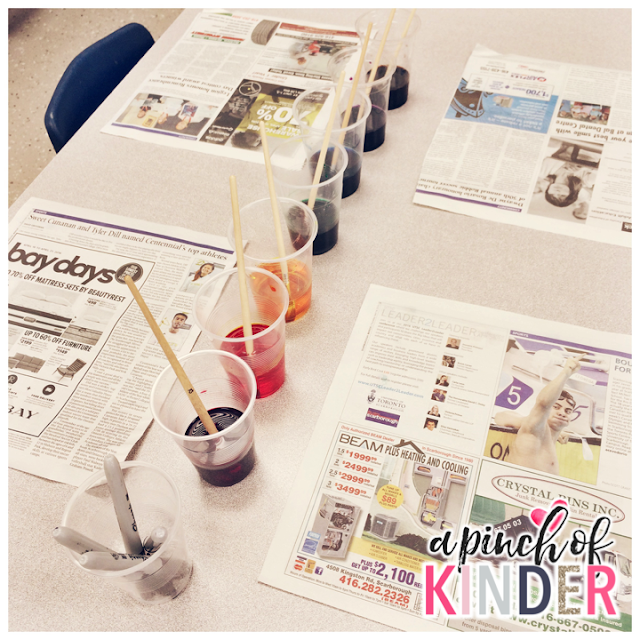 Then we used the paint on newspaper to reduce the amount of copy paper we are using too. We haven't had painting out much this year so the kids have been loving this area! The book above "Actual Size" by Steve Jenkins was recommended to me at a workshop a couple of weeks ago so I borrowed it from the library and let me tell you it is one of the coolest books I have found recently! The book is about animals and has interesting facts about each animal and a picture of the animal on each page. The best part is the picture is the ACTUAL SIZE of the real animal! The kids had fun looking at the book, comparing sizes etc. I photocopied a couple of the pictures from the books and set them out with some measuring tools so the kids could practice measuring the different animals. 3. How Tall Are You in Cubes? This was another big hit. I saw this a couple weeks ago when I got to visit another Kindergarten classroom in my board. Every 10 snap cubes is a different colour and is marked with the number (10, 20, 30 etc.) to support skip-counting and counting on. 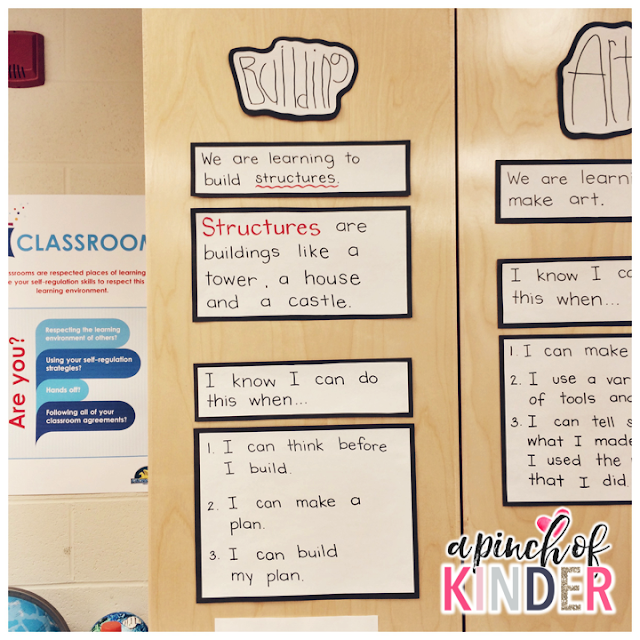 I also put some sentence starters and hang them beside it to support writing here. "How Tall Are You in Cubes?" "I am ___ cubes tall." "_____ is _____ cubes tall." (for when they are writing about a friend's height). 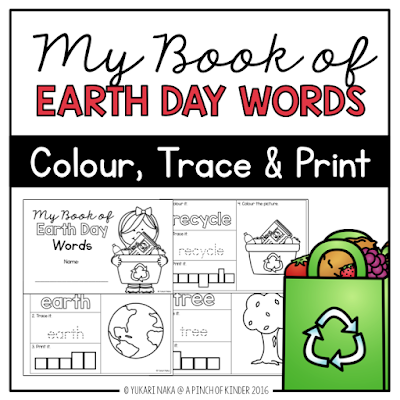 I throw these thematic word booklets in the writing centre near holidays and special days to increase their vocabulary and help the students practice spelling and printing. 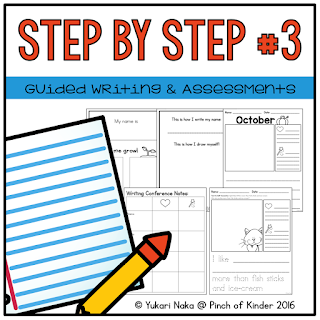 You can grab this mini book in my TPT store by clicking on the image below! I got this idea to set out letter and sight word rocks with paper, pencil and letter stamps from a teacher in our district a few weeks ago. I couldn't find anywhere to buy wood slabs around me and didn't want to bother cutting and treating real wood myself (I'm not very handy if you couldn't tell.. lol) so I just bought these on eBay. You can check out the one I bought here. It comes from Latvia but only took about 10 business days! I got the rocks from Dollar Tree and used Sharpie paint pens to write the sight words and letters on them. I was happily surprised to see kids of all literacy abilities enjoying this centre. Some kids just looked and matched and stamped letters, some kids made sight words, some kids wrote them down etc. I'm looking forward to swapping out the alphabet elements weekly and keeping this centre around for the month of May! Click on the image below to link up with Kacey too or share your Five for Friday in the comments below! Hi guys! 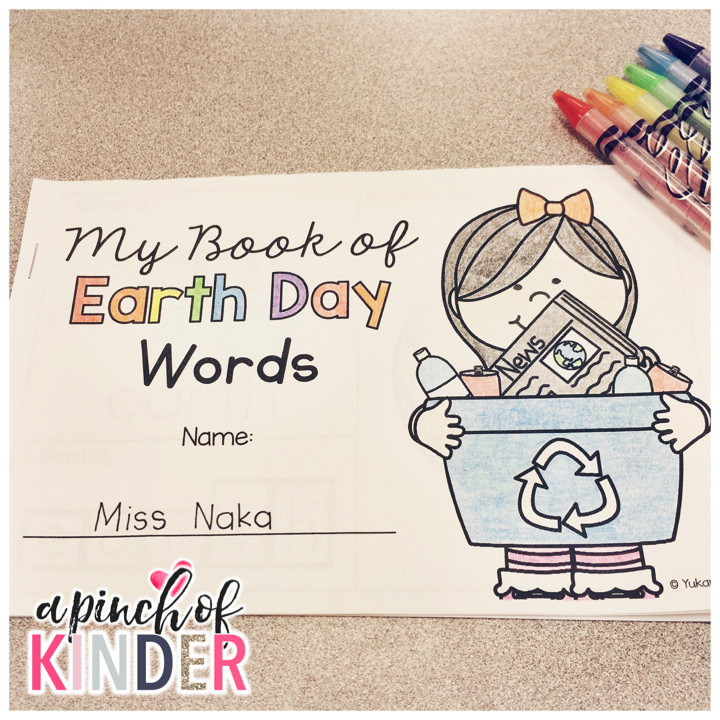 I'm linking up with Kacey at Doodle Bugs Teaching for Five for Friday to share 5 things from my week! I got this activity from Coffee Cups & Crayons. I printed sight words on popsicle sticks and set them out with brown clay. 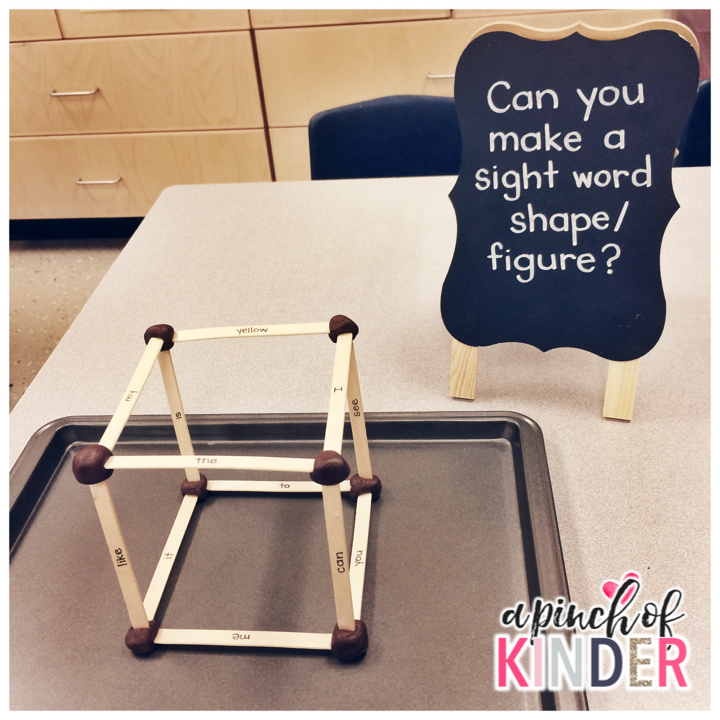 I encouraged the kids to read the sight words as they built their shapes and figures. 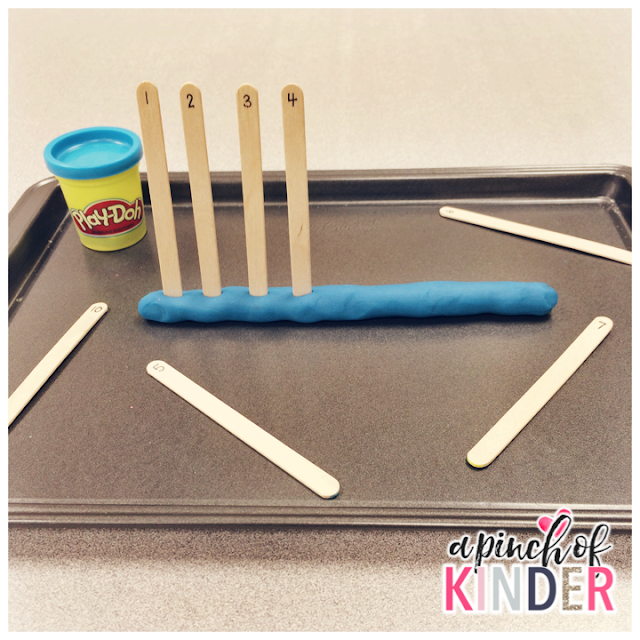 I still have lots of kids who need fine motor development and the clay has great resistance and is fantastic for building stronger finger muscles! 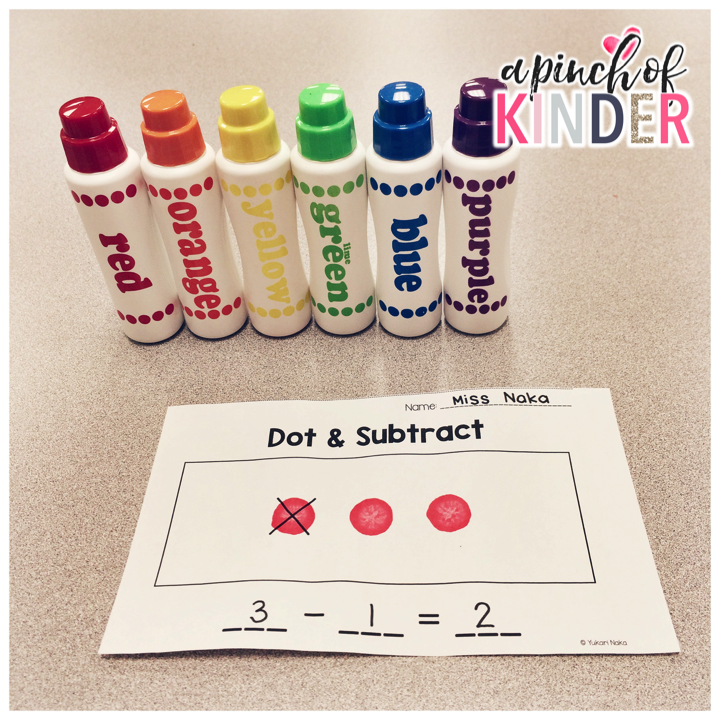 Here is another fun, easy & cheap math + fine motor centre! I found this idea on Twitches. All you need to do is thread a pipe cleaner through a button and then secure it by twisting the pipe cleaner. Then cut felt pieces into squares (or any shapes really) and cut a small slit in the middle of the felt. Students are encouraged to make a pattern with the felt by threading the felt through the button and on to the pipe cleaner. 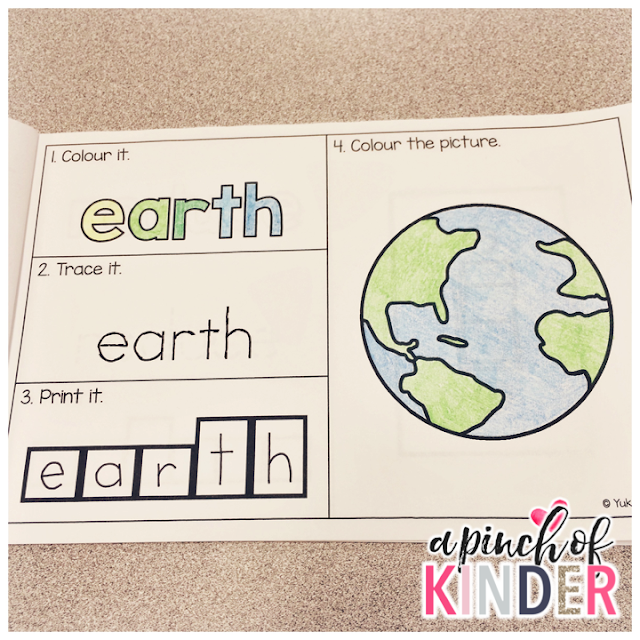 This one was another great one for fine motor and the kids loved it too! We have been encouraging the kids to make plans when building and introduced a new area to display our learning. First we introduced the learning goal and success criteria. 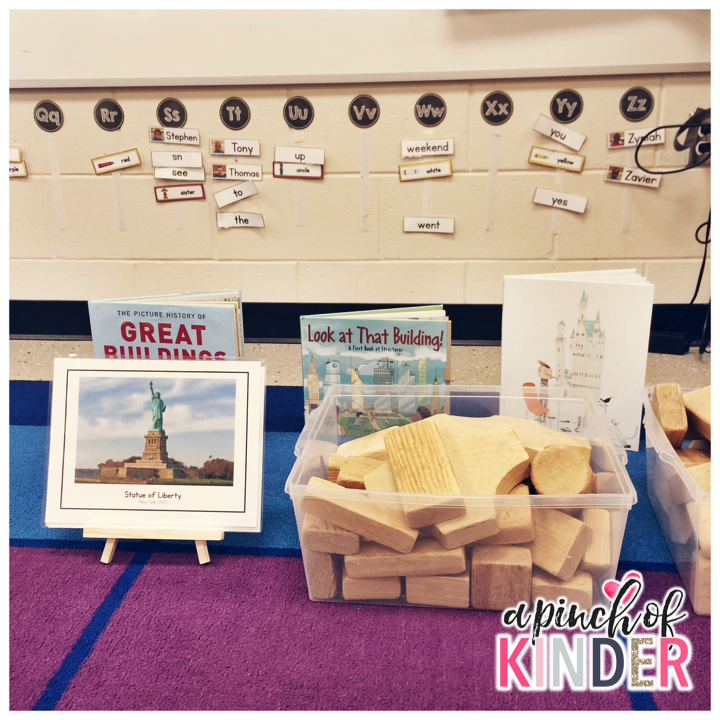 Our teammates lent us these awesome wooden blocks so we set them out with some photos of famous structures and some books about building. 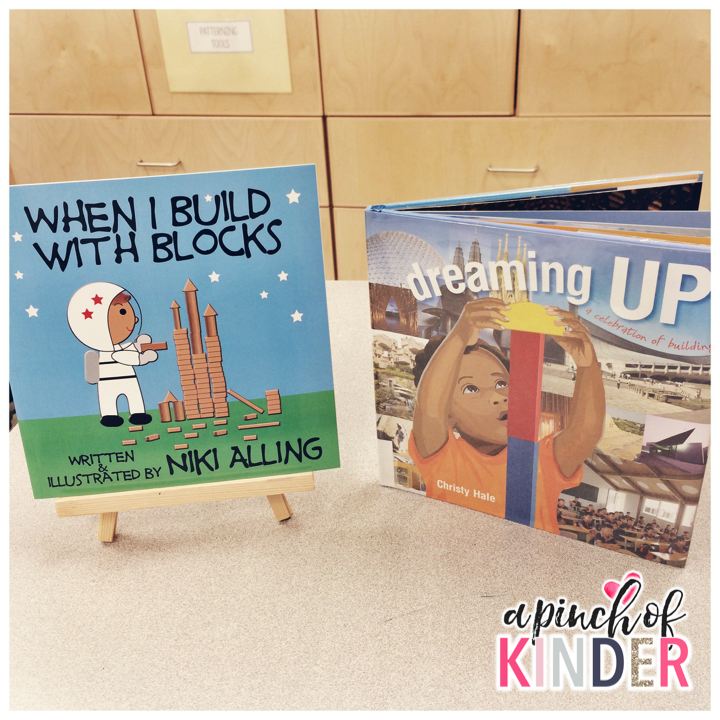 The pictures and books give them a great visual and a starting point for making a plan for their structure. Here are some more books that I picked up and plan to swap in to spark new ideas. 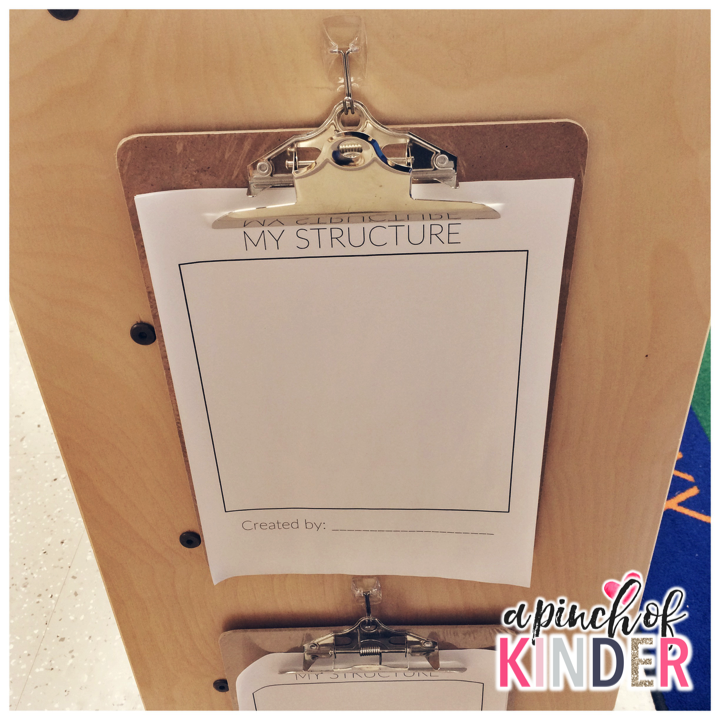 I have these clipboards hanging near the building area so that the kids can draw and write about their structure if they want. Then I display them on the building board. This motivates them to draw and write about their structure. When I can I snap a picture of their structure and we print and glue it onto their sheet as well. So far the addition of the learning goal, success criteria, visual supports and the option to write has made this area a lot more purposeful which we are so happy about! 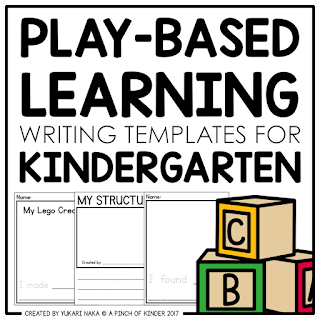 You can find similar building writing templates in my "Play-Based Learning Writing Templates" pack on TPT. Click here or on the image below if you are interested in grabbing them! 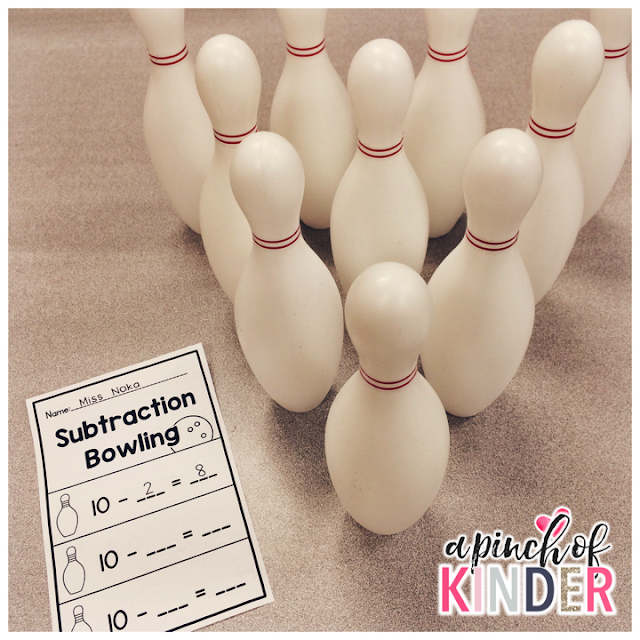 We wrapped up subtraction this week and I put up some more work on our addition & subtraction bulletin board after school tonight. I always have the kids make the title of our bulletin boards. I have our learning goal and success criteria on the right hand side, followed by our addition and subtraction strategy posters. 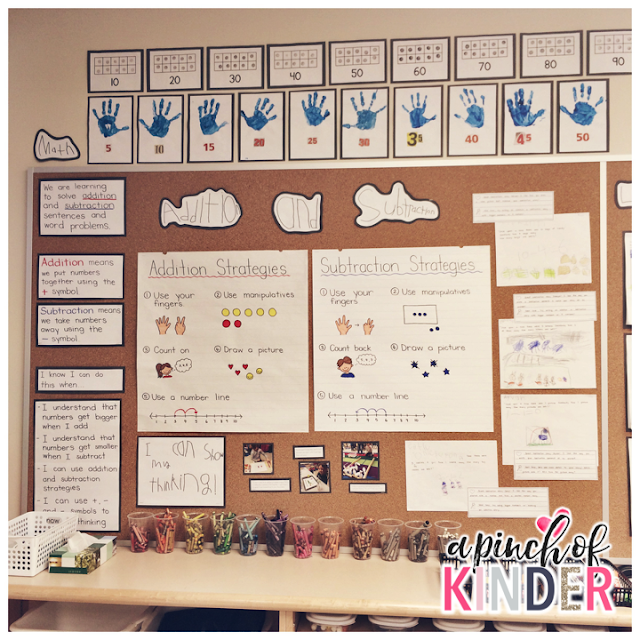 Under that I displayed some pictures of the kids working at some of the addition & subtraction centres and documentation of the math talk/thinking they displayed there. On the right hand side I also displayed some of the addition & subtraction story problems the kids made with descriptive feedback. I have full blog posts on both teaching addition and subtraction in Kindergarten. In February we started to display our writing on one of our bulletin boards and the kids love it. They like to look at their friend's work and find their own too. I think knowing that their work will be up on display motivates them to do their best too. We originally titled our board just "Writing" but we changed it this month to "Listening, Thinking and Writing". As a division we have started to focus on writing responses to readalouds so I thought this title would be more reflective about how our writing is evolving. This month we are focusing on making and writing predictions. We used the text Emeraldalicious and tied it into talking about Earth Day and taking care of the Earth as well. We stopped before the page that Peter makes his wish and we asked the kids "Pinkalicious wished for a throne, flowers and birds. 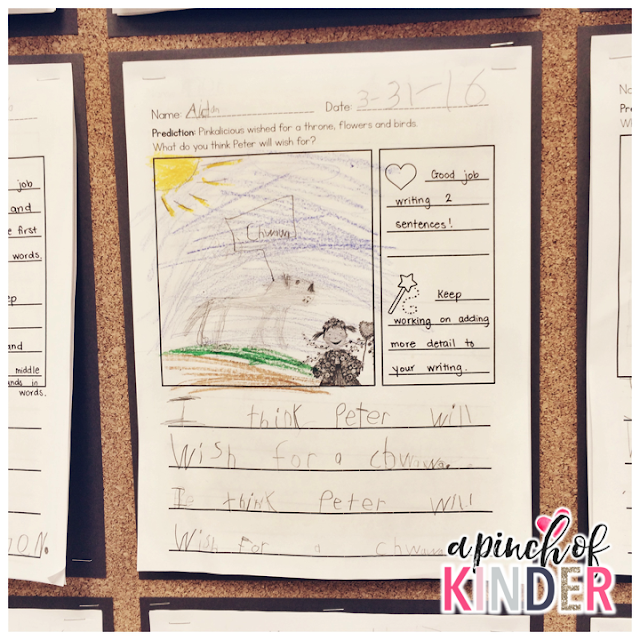 What do you think Peter will wish for?" "I think Peter will wish for a chihuahua. I think Peter will wish for a chihuahua because they are cute." 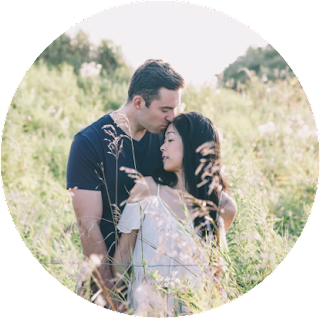 Link up with Kacey too to share your Five for Friday! Today I'm sharing my subtraction lesson plans & activities from this year. 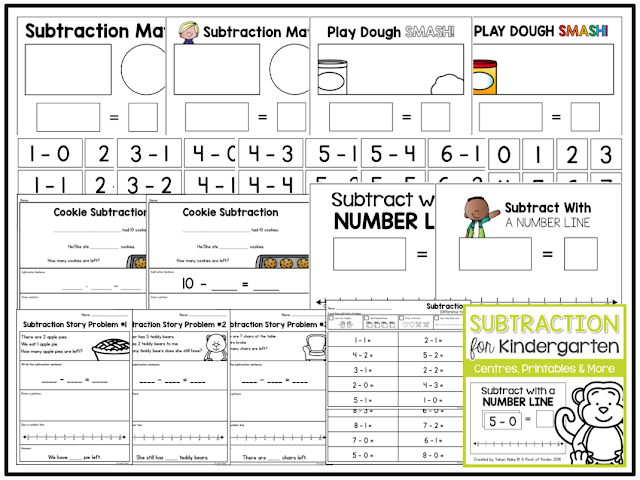 I hope this can give you some ideas for planning your subtraction unit! and we practiced the ___ take away ___ is ___ subtraction sentence by acting the song out and writing a subtraction sentence as we sang and acted out the song. I had the kids sit on the edge of the carpet and laid down a mat to act as out bed. 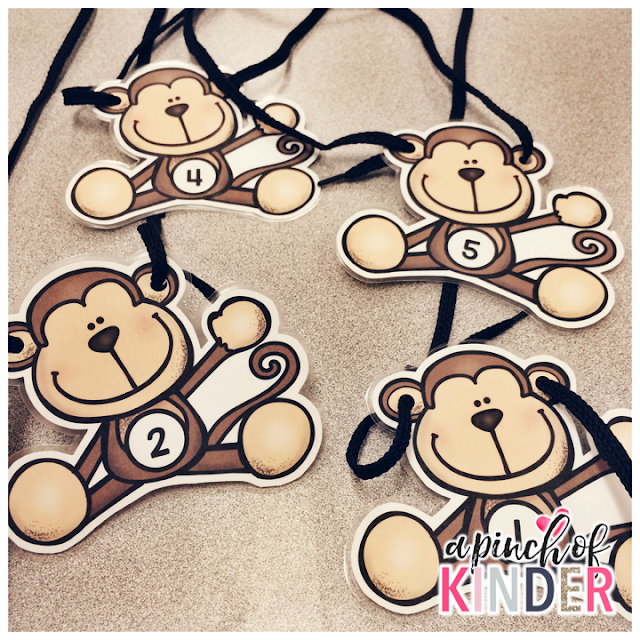 Then I chose 5 kids to wear these number necklaces and stand on the mat. We sang the song and the kids acted it out by jumping on the "bed". At "one fell off and bumped his head" the kids hopped off the "bed" and just lightly tapped their head with their hands. Then they went and sat back in their original carpet spot or chair. 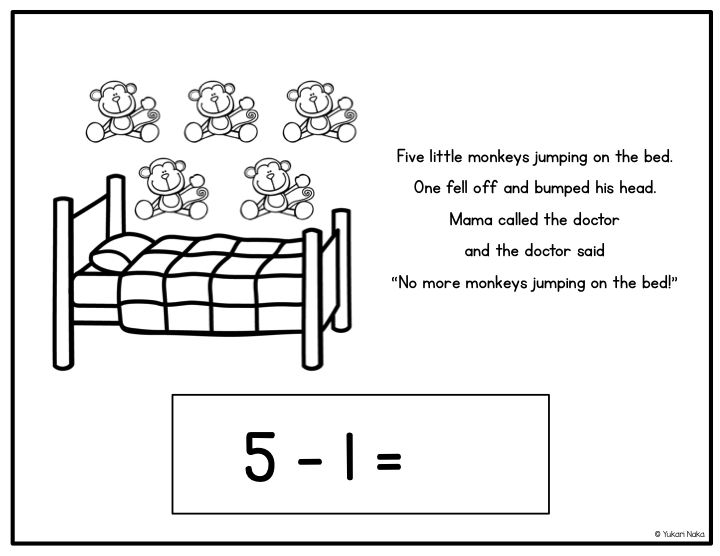 We wrote a subtraction sentence on the whiteboard each time a monkey "fell off the bed". The number necklaces helped them remember who was falling off the bed. 5 is first, 4 is second etc. 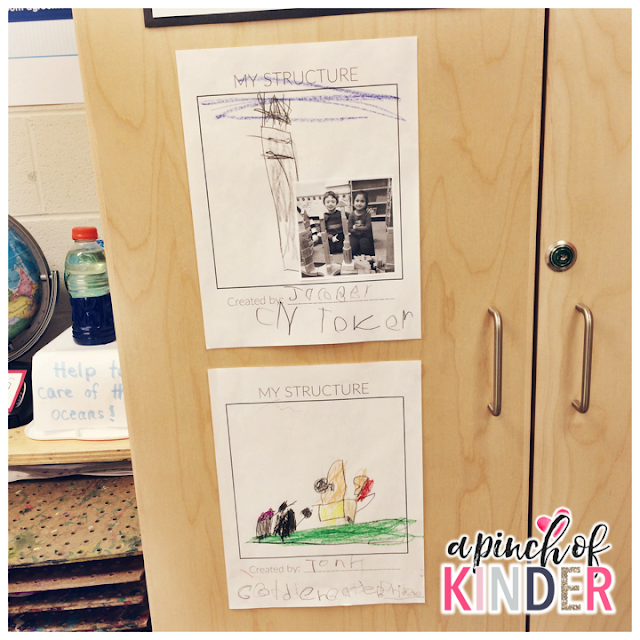 They loved this activity and begged to do it again the next day! 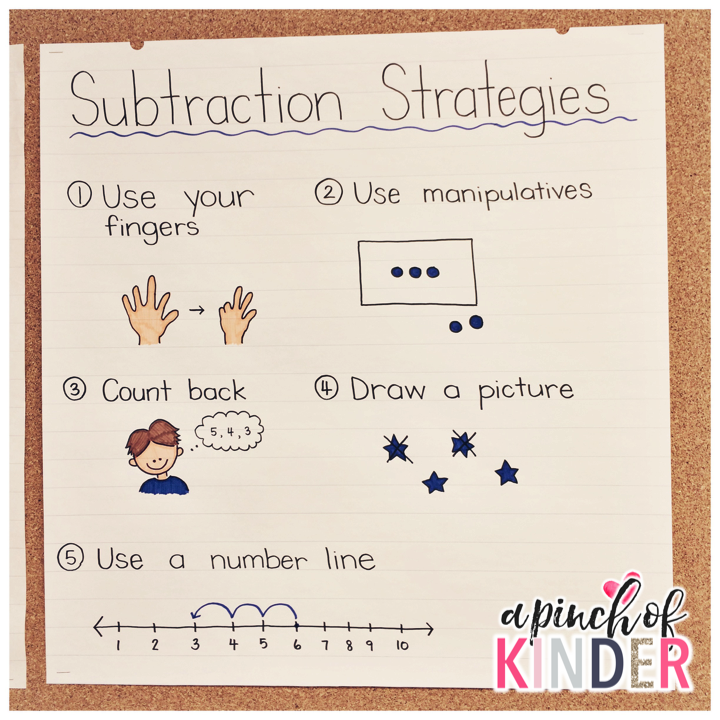 We reviewed the anchor chart from day 1 and practiced subtraction with 5 Little Monkeys again. 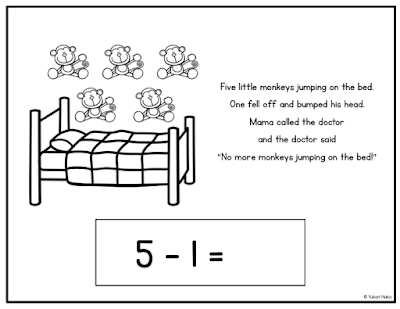 We sang and acted the song out like Day 1 but I also put this file up on the SMARTBoard and we practiced crossing out a monkey on each slide and completing the subtraction sentences as well. On Day 3 we introduced the learning goal and success criteria. 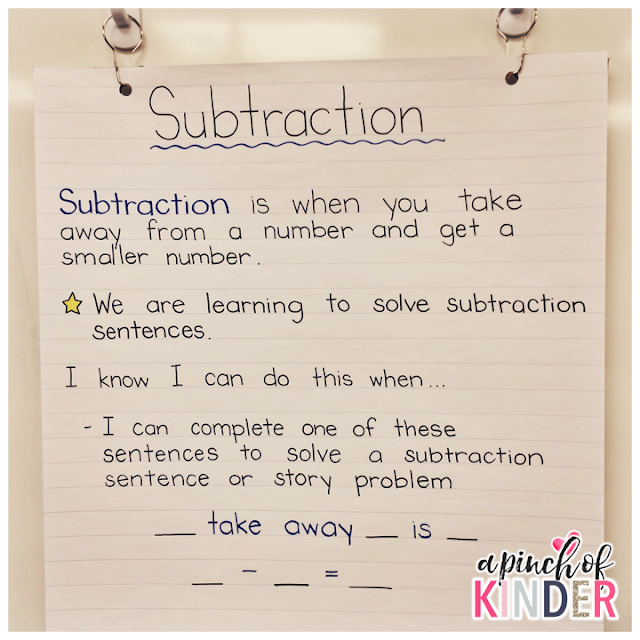 Learning Goal: We are learning to solve subtraction number sentences and story problems. 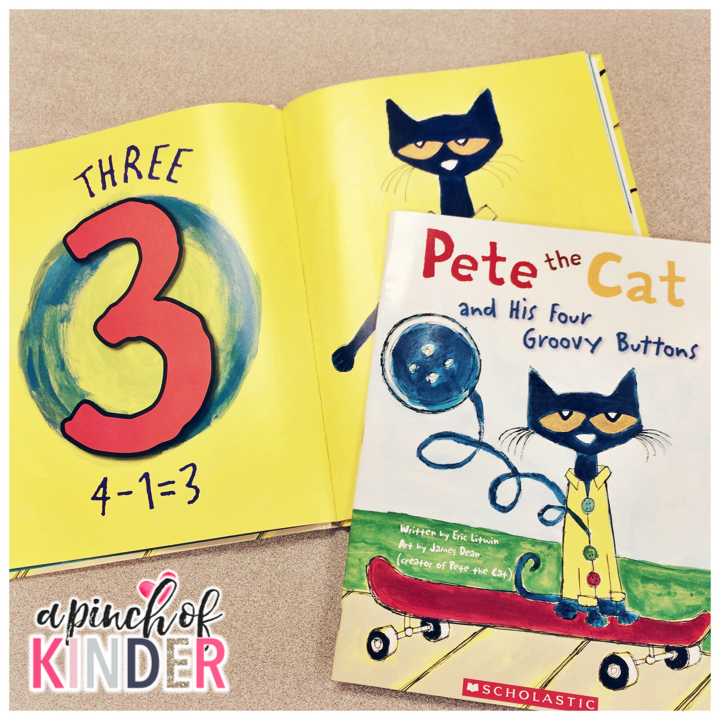 I also showed them how to solve subtraction sentences with fingers and then we practiced this strategy as we read Pete the Cat & His Four Groovy Buttons. This is my FAVOURITE book to read during our subtraction unit! It is great for teaching the subtraction symbols in the context of a fun story! 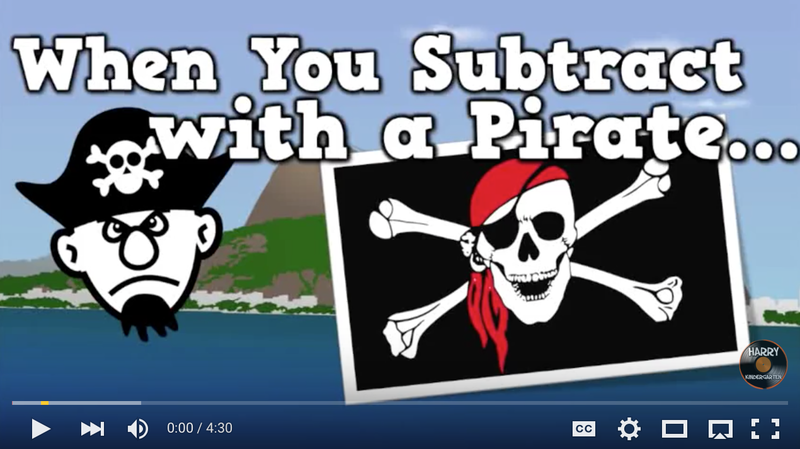 and we practiced the strategy "use your fingers" again while watching the video "When You Subtract with a Pirate" on YouTube. 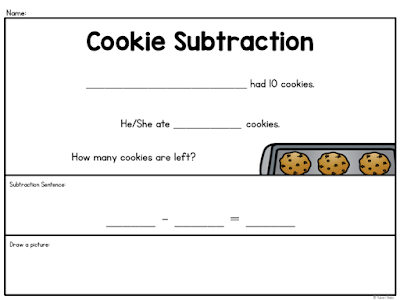 I put a couple stacks of the subtraction flash cards and pick students to choose a subtraction card and read the equation. 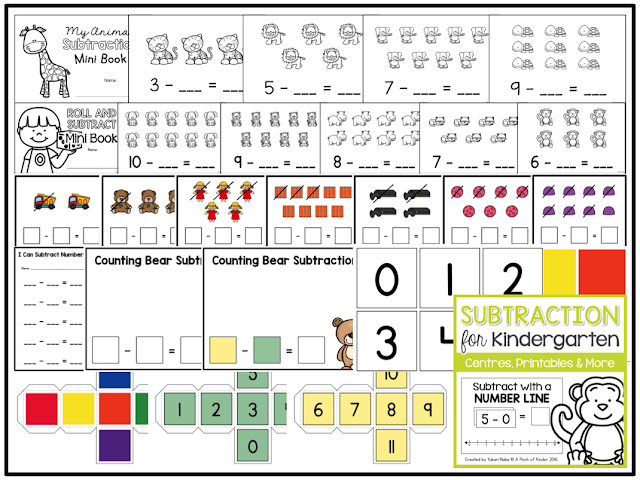 I demonstrate how to read the first number and put that many counters in the rectangle. Then we read the second number and take that many away and put them in the cup. Then we count how many counters are left in the rectangle, find the answer card and place it on the mat. Then I leave this out for the kids to try at centres as well. On Day 7 we start working on subtraction stories and the strategy draw a picture. Then I had the special helper pick a friend from the class and pick how many cookies that person ate. We filled in the blanks together, read the question again and wrote the subtraction sentence. Then we drew 10 cookies and crossed out the number the they picked to practice the "draw a picture" strategy. We repeated this several times and then I set it out as a centre for the kids to try on their own. 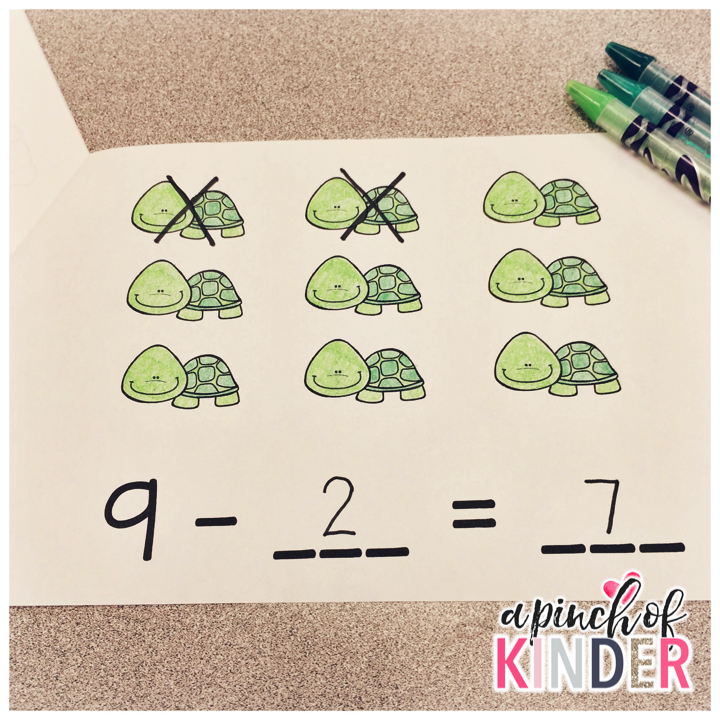 We quickly talked about "count back" as a strategy and showed them how to put the first number in your head, put fingers up for the second number and then count back as you put fingers down. This is a tricky strategy though so I don't focus on it much! 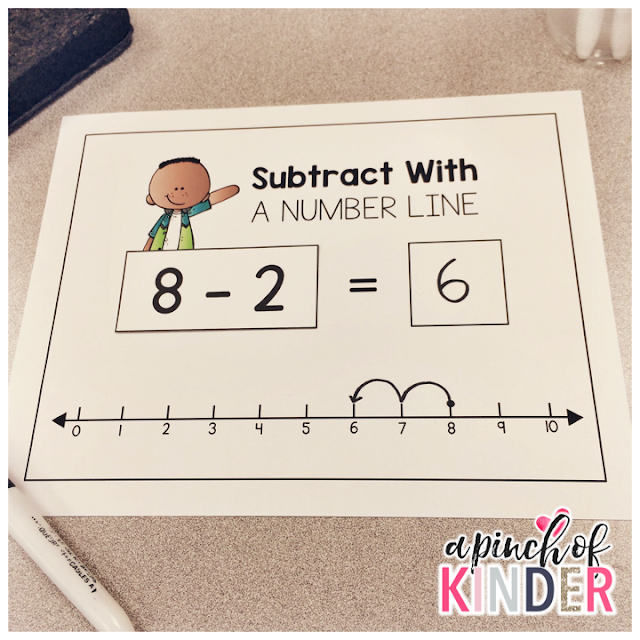 Then I move on to use a number line. We review how numbers get bigger when you go left on a number line and smaller when you go right on a number line so when we subtract we go left. 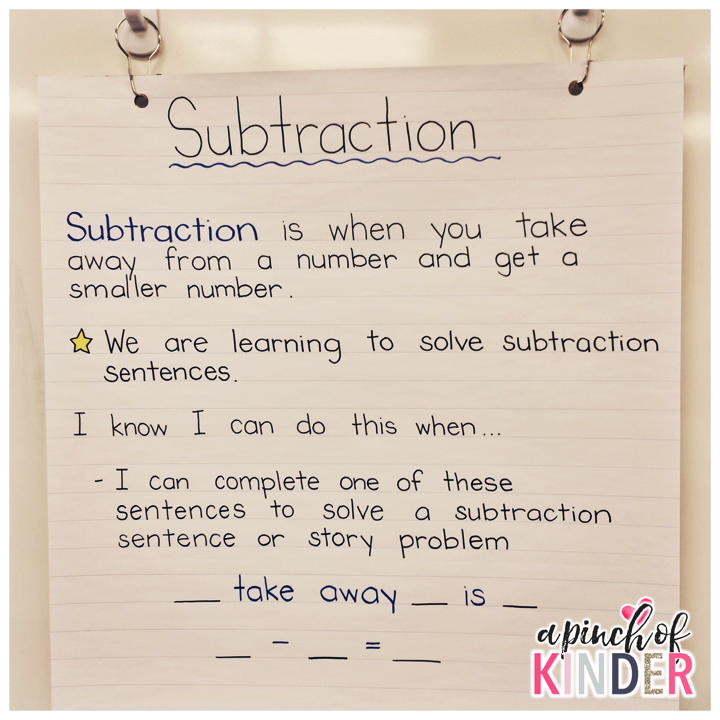 Then I get a student to pick a subtraction sentence card and read it to me. I put this mat up on the SMARTBoard and we write the question, use the number line to solve the question and write in the answer. 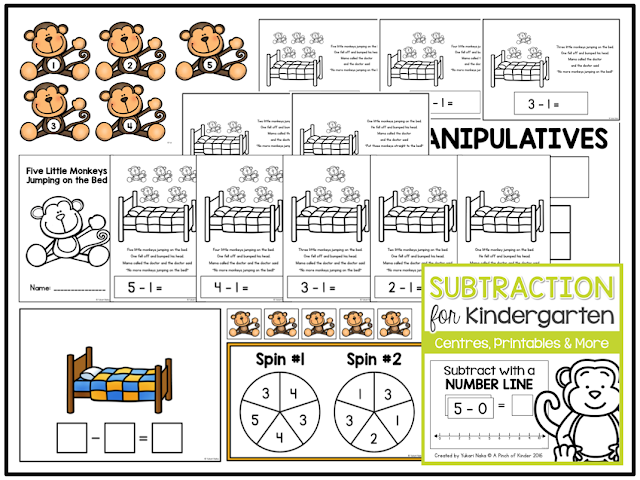 I also leave these laminated sheets out as a centre choice for the kids to practice with independently. 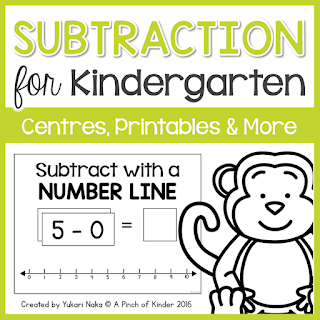 Here are some other subtraction centres that are out during out subtraction unit! Students spin the two spinners and create a subtraction sentence. 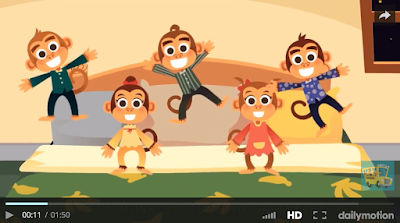 Then they use the monkeys as manipulative to solve the question and place the answer in the third box. 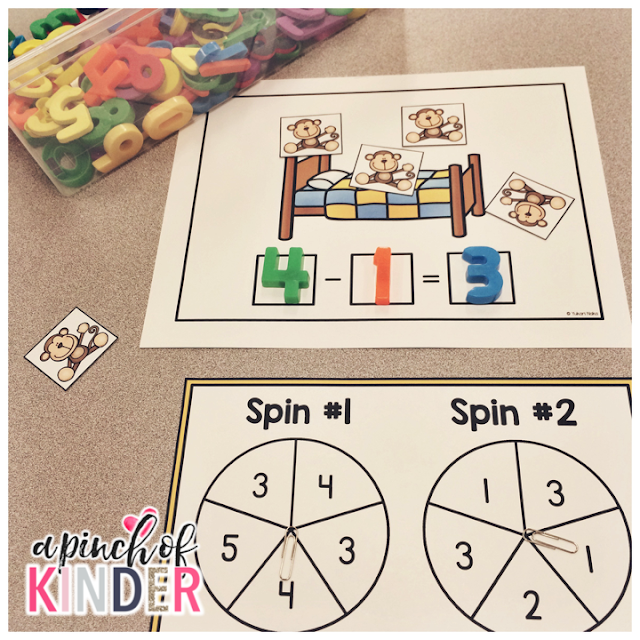 We used toothpicks and paper clips to make the spinners! The kids just hold the paper clip in the middle of the spinner and flick the paper clip with the other hand. This one is always a huge hit! In the past I've just used water bottles and a tennis ball but this year I found this plastic bowling pin set at Michaels and bought them since they were on sale! We set up a bowling alley with our wooden blocks (arranged in the shape of a U) and 2 kids took turns rolling and recording how may pins they knocked down and how many pins they have left. You can grab the recording sheet you see above for free by clicking on the image below! 4. 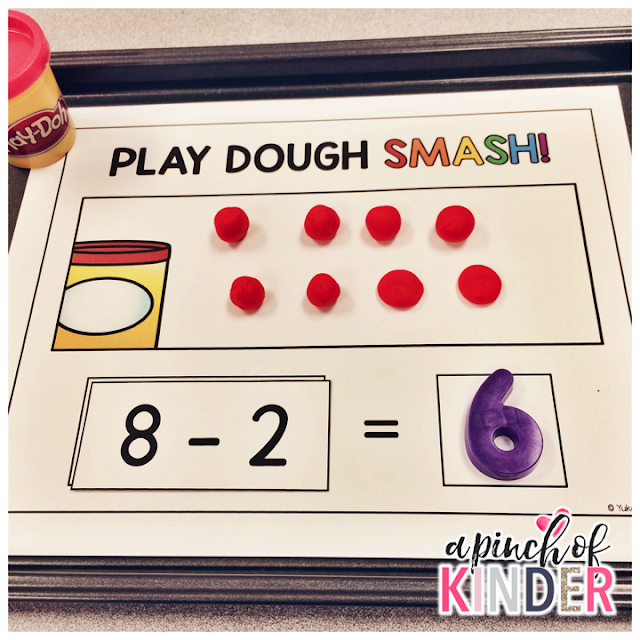 Play Dough Subtraction SMASH! This was another big hit! 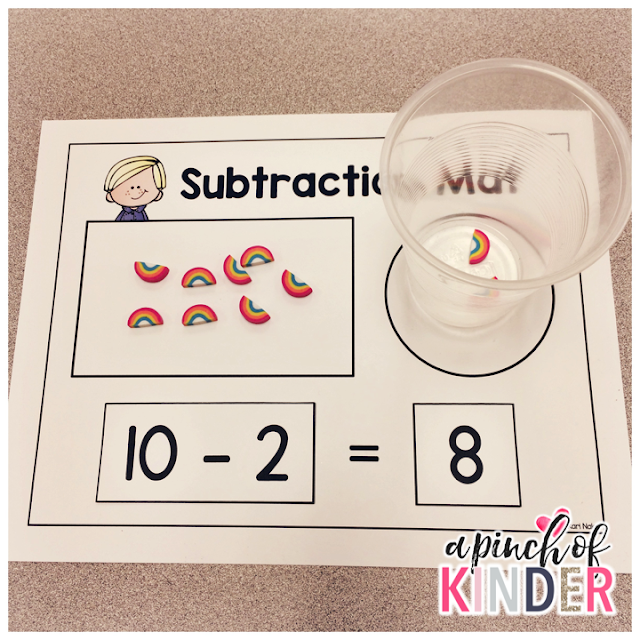 The students pick a subtraction sentence card, make play dough balls for the first number and smash (or smush) the second number with their first or thumb. Then they count how many play dough balls they have left to get the answer. 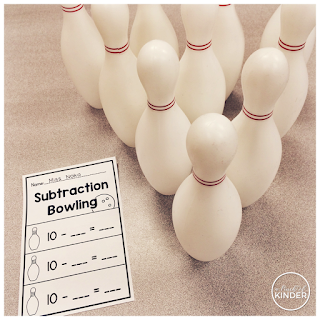 We used these in guided math groups for students who needed some more practice with subtraction. 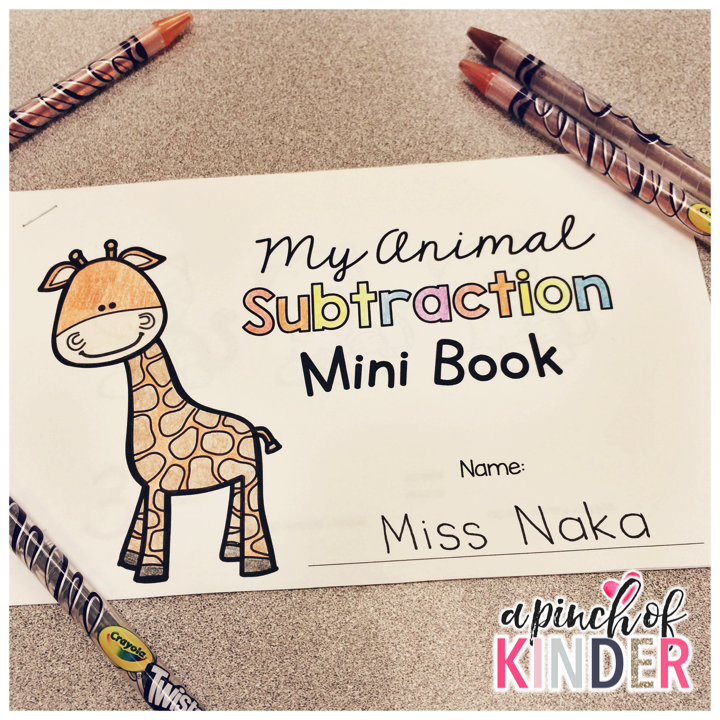 The kids got to pick how many animals they wanted to take away, cross them out and write a corresponding subtraction sentence. Yes, these stamps again! #obsessed. 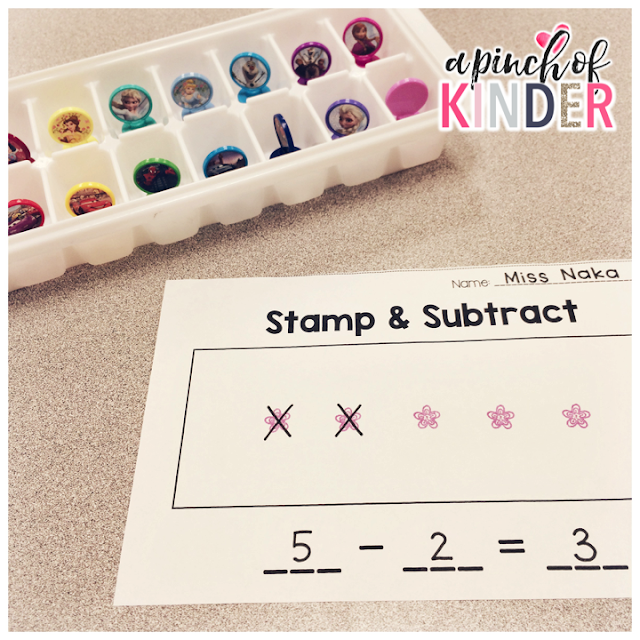 For both activities they stamped or dotted first and then they crossed out however many they wanted and wrote a subtraction sentence to match their picture. 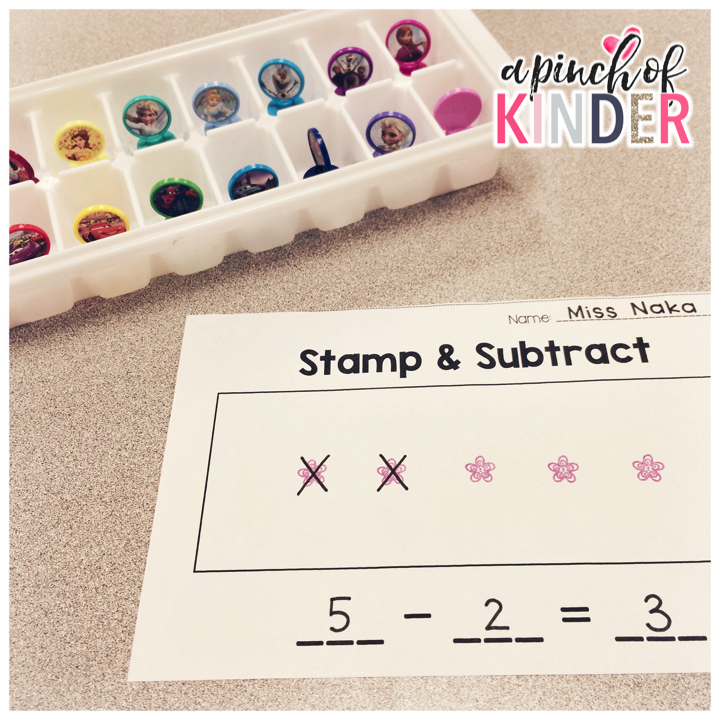 The "teacher bingo dabbers" only come out once in a while so the kids are always excited when they get to use them! All of the other printables you see in this blog post can be found in my subtraction pack on TPT "Take It Away! A Kindergarten Subtraction Unit". If you are interested, you can check it out by clicking on any of the images below! I hope you were able to gain some new ideas for teaching subtraction! 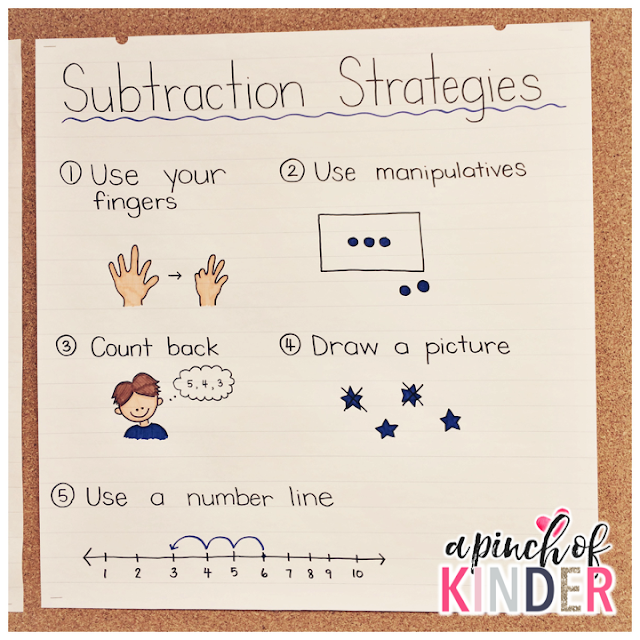 What are your favourite lessons and activities for teaching subtraction? I'm linking up with Kacey from Doodle Bugs Teaching to share 5 things from this week! We introduced story writing this week. I saw @ourkindergartenfamily post this picture on Instagram and knew I had to copy their idea! I whipped up a quick cover for our "A Wordless Text" booklets. Then I introduced them to the wordless story "Chalk"by Bill Thomson. One of my teaching partners from next door introduced this text to us! Thanks Cristina! We "read" this whole group and talked about what was happening in the story and how we could tell. We made lots of predictions and inferences and talked about how the details in the picture help tell the story. 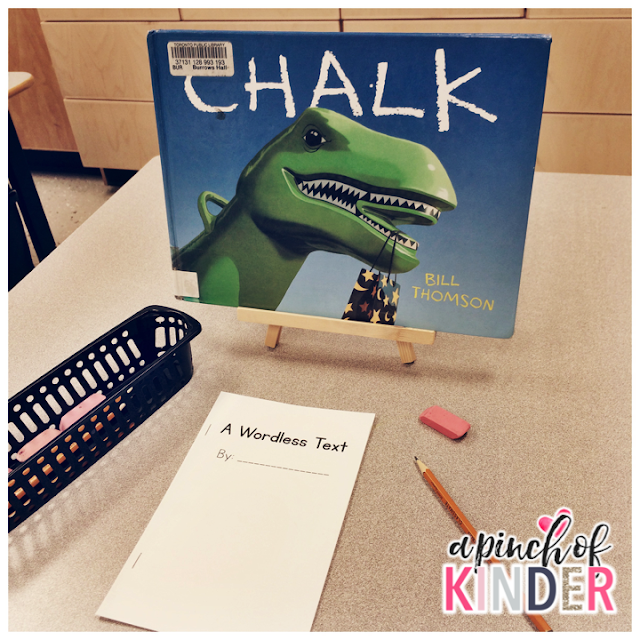 Then they were invited to create their own wordless texts at centre time. 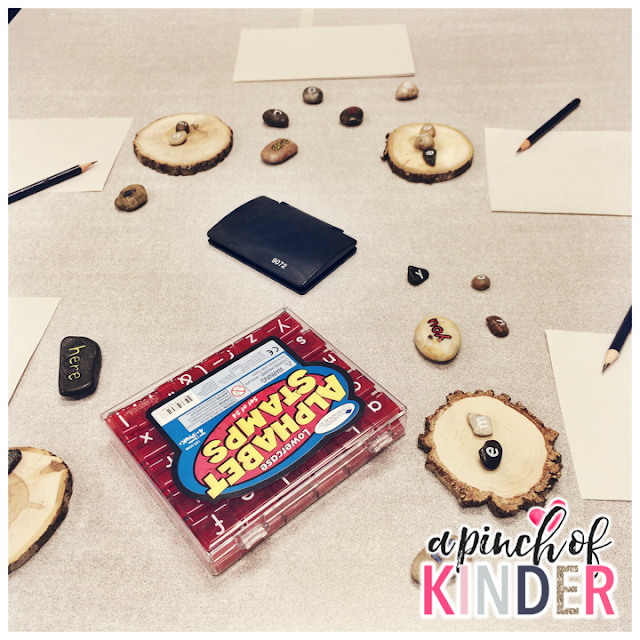 I love how it was accessible to all abilities in our class and we had a few happy surprises in terms of kids who chose to go there/were very engaged there! If you would like a copy of the cover that I used you can download that by clicking on the link below! I think the title says it all but this is a super easy prep and low cost centre idea for practicing number order (which is a surprising area of need in our class!) I just printed the numbers 1-10 on popsicle sticks and set them out with play dough. I told the kids to make a log and put the popsicle sticks in order from 1-10 on the log. 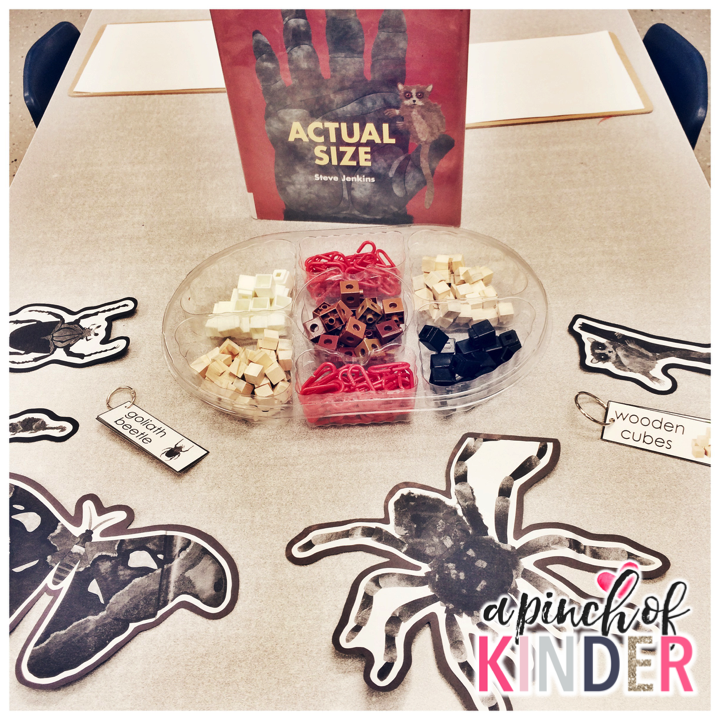 The kids loved this and my friend Rachel (you might also know her as @thekinderteacher on Instagram!) said that she does this with words as well, which is SO smart! I'm going to incorporate that into my morning centres next week for sure! I was fortunate to be able to participate in the first annual "Kindergarten Krawl" last week where we got to visit 3 Kindergarten classrooms in our board after school. We got to go in the classroom, take pictures, talk to the classroom teachers etc! 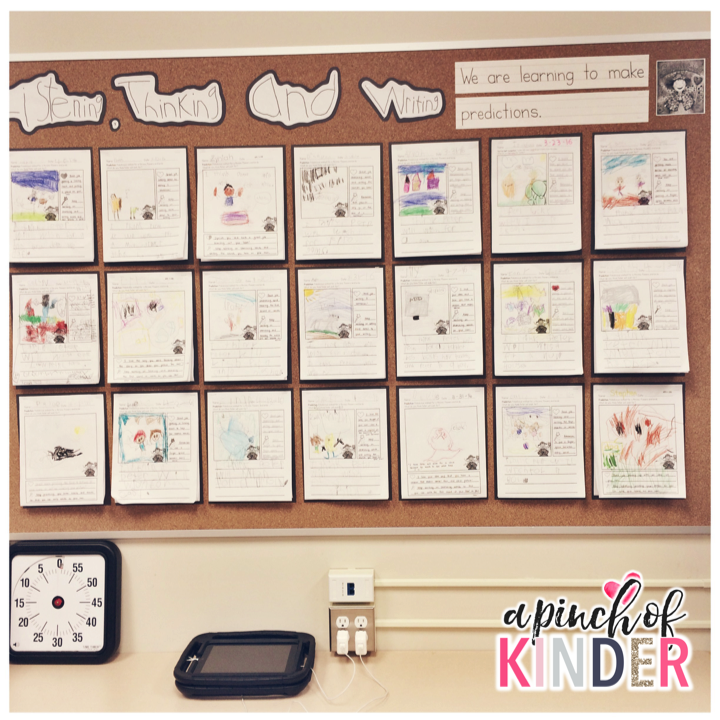 It was so cool to see the amazing things that are happening in other people's classrooms! I saw this number provocation in one of the classrooms and since I had the book I knew I had to try it! The pictures are from the book "Teeth, Tails and Tentacles" by Christopher Wormell. I copied the pages (reduced 80% for the top pages and 50% for the bottom pages) and glued them onto black cardstock. 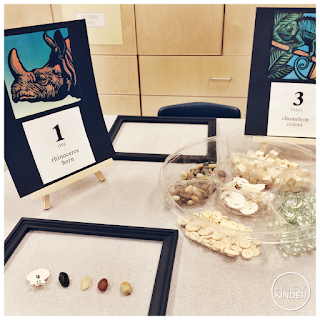 Then I set out some loose parts (rocks, wooden cubes, wooden buttons and glass pebbles) with shells with dots, number, a combination of numbers and dots and +, - and = on them. I had the kids create anything they wanted inside the frame. 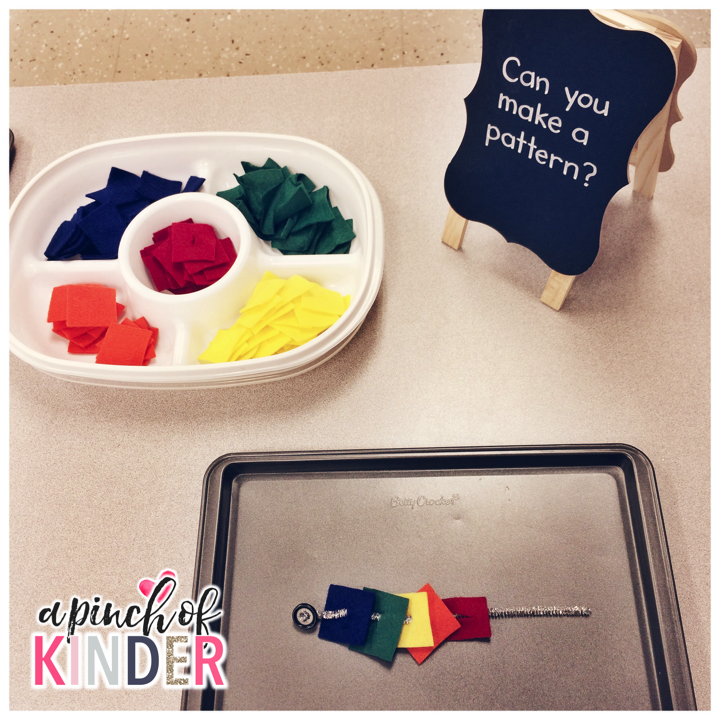 Some kids made patterns and some practiced counting. This was only open for one afternoon this week so I'm excited to see how they will continue to use this provocation next week! 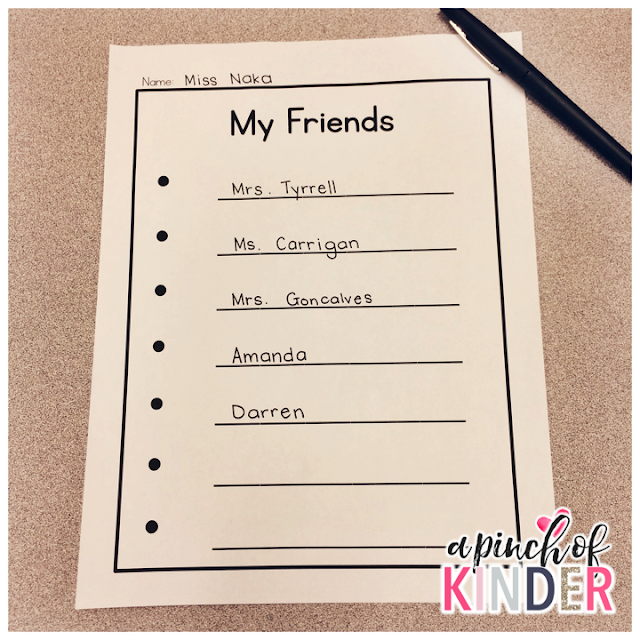 We have been working on list writing as well and this "My Friends" list writing has been a huge hit ever since it was introduced. 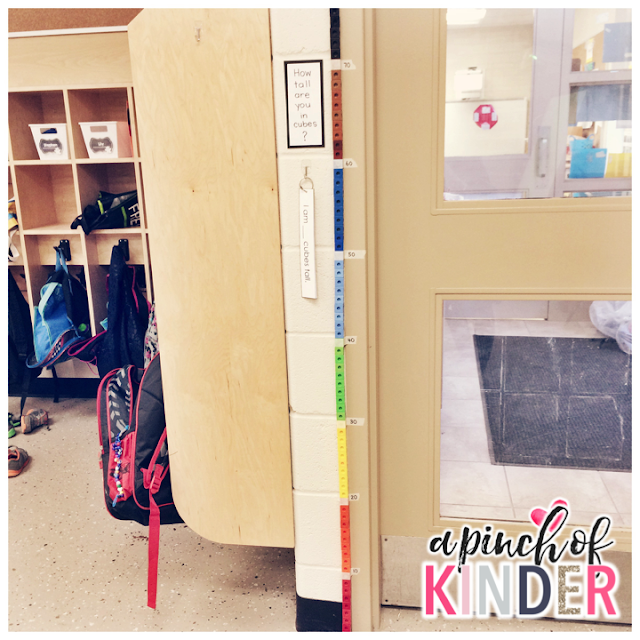 I have their names on the word wall so that they can go and get the names that they need and copy it onto the list. Next week I'll be introducing them to a more open-ended list where they can come up with the topics themselves! 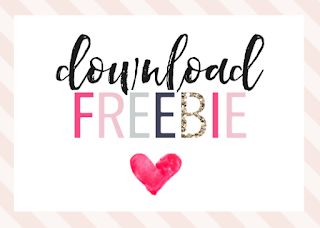 You can download all of my list templates for free by clicking on the image below! Today was a PA Day so we spent the morning in our own school (staff meeting) and then we went to a workshop of our choice in the afternoon. I went to a workshop called "Meaningful Math, Inquiry and Play" by Cheryl Herder and it was great! I loved that there were so many ideas for provocations set up that we could get ideas from and try in our own classrooms right away! I snapped the picture above at the workshop and am going to incorporate it when we review measurement in a few weeks. 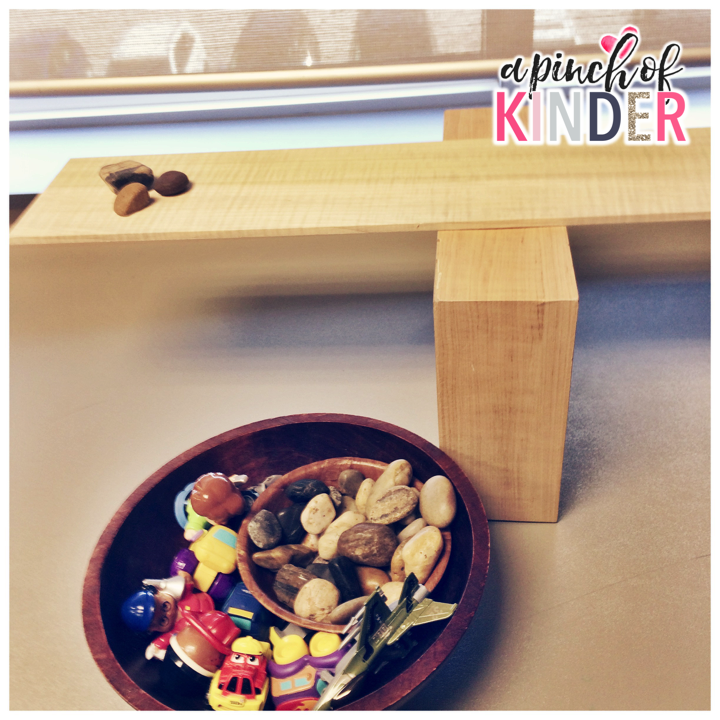 She made a scale out of wooden blocks, set out some loose parts with the book "The Balancing Act" by Ellen Stoll Walsh and had a sign that said "Can you make it balance?" I highly recommend this workshop if you get the chance to attend it! Click on the image below to link up with Kacey and share your Five for Friday too!